This popular groundcover's evergreen grass-like leaves will last through winter. 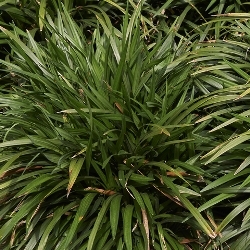 Liriope will tolerate full sun, but you will get better foliage color in the shade. Used most effectively as an edging to a border of shrubs. Makes a great ground cover. Liriope Spicata is also known as 'Creeping Lily-turf' or ‘Monkey Grass.’ Its green leaves have pale pink flowers and it is a hearty drought-resistant plant for Texas and southern landscapes. Some consider it invasive. For Fall Planted Liriope please click here. These are mature, undivided field-run Clumps. Economical and fast-growing - 10-15 pip plants. Liriope Spicata is also known as 'Creeping Lily-turf' or ‘Monkey Grass.’ Its green leaves have pale pink flowers and it is a hearty drought-resistant plant for Texas and southern landscapes. Some consider it invasive. For Fall Planted Liriope Clumps please click here. Liriope Spicata is also known as 'Creeping Lily-turf' or ‘Monkey Grass.’ Its green leaves have pale pink flowers and it is a hearty drought-resistant plant for Texas and southern landscapes. Some consider it invasive. One bushel (approximately 100 plants) will cover an average of 100 sq. ft.
For Fall Planted Liriope Bushels please click here.